Just 15 minutes from Biarritz, Bayonne offers a quieter life style. Bayonne (map) sits on two rivers, the Adour and the Nive, and is a major port for the Basque region. It has a long history, including several hundred years of English rule starting in the 12th century. But today's Bayonne is definitely French, and a charming place to visit. 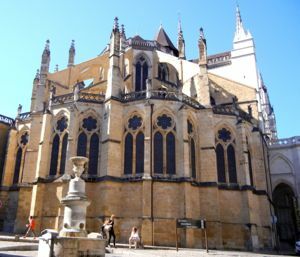 Wander the narrow streets and visit the cathedral and its cloisters. Enjoy the views along the river banks and Petit Bayonne. There's lots to see and do here. Known for its ham—jambon de Bayonne is just one variety found locally—and its chocolate, Bayonne is a great place to eat, with many restaurants and cafés. Bayonne also gave its name to the bayonet, which was invented here early in the 18th century. 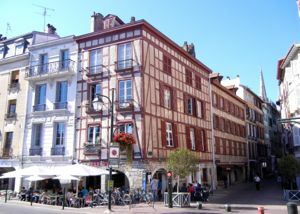 Bayonne is about 8 kilometers (5 miles) from lively Biarritz, easily reached by bus or train; and 22 kilometers (14 miles) from the lovely seaside town of St-Jean-de-Luz. Below, Colorful riverside buildings, Bayonne.